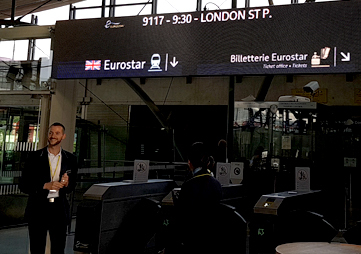 A Franco-British train company, Eurostar has been running since 1994 TGV from Paris to Brussels to London through the Channel tunnel. to complete their already existing display system with new hardware and a new vision of traveler information, while aiming at a unified global solution. need in temporary displays depending on which access gateway is opened for each train. 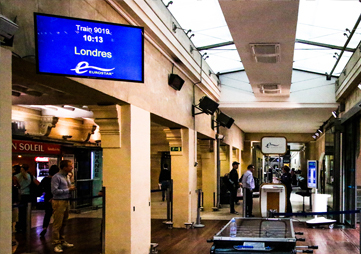 On this specific requirement, we proposed 2 SAM monitors, entirely autonomous and mobile that Eurostar agents can move depending on their needs. 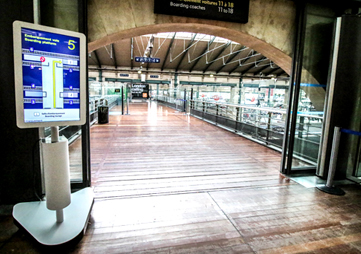 3 Mediabox players to manage their pre-existing monitors and LED banner in the Lille Europe terminal.